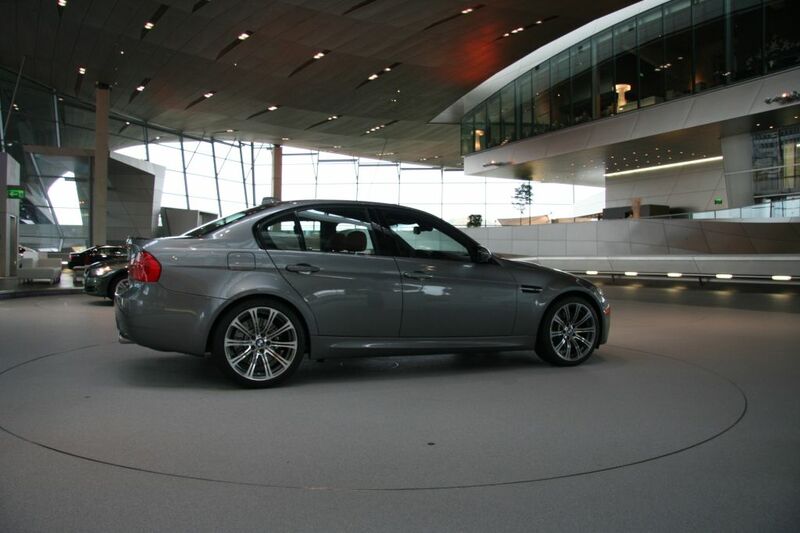 I picked up our 2009 M3 sedan (LCI) last Saturday in Munich, one of the first U.S.-spec models to be delivered since the update took place. I was very happy to see that the Space Gray and Red Fox leather combination worked well together, as we had not been able to see a good example of it in person at any of the U.S. dealers before we left (a couple of shots attached). Delivery at BMW Welt went well, the building is really impressive and since ours were the first delivery that morning, I had the place almost to myself for about an hour. As some others have noted, the technical briefings and the like are not very sophisticated, but the technology employed to make the show is pretty neat. 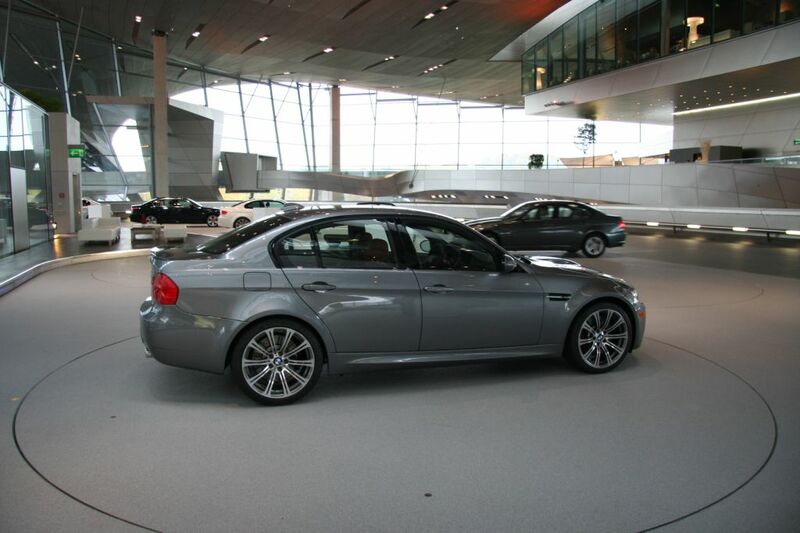 Ours was one of two M3s being delivered that morning, along with an M5. After the briefing, you get to walk down a set of stairs that take you right down to your car, on a revolving turntable on the main floor. 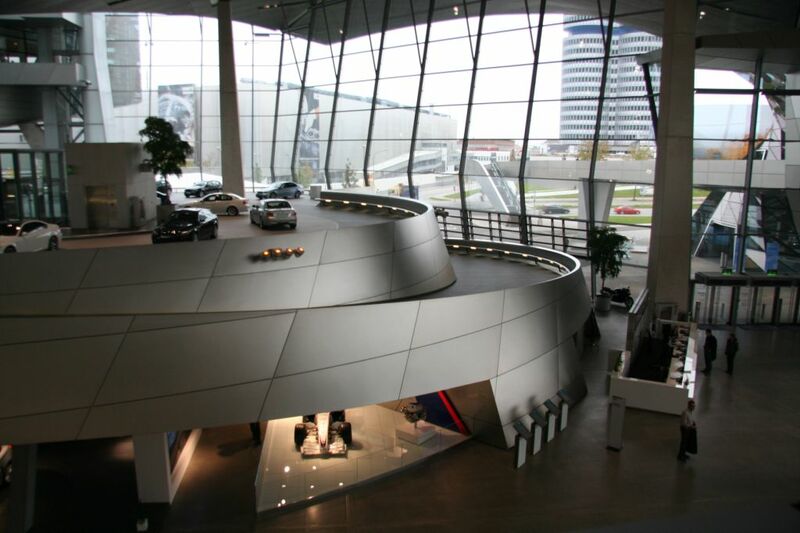 It was really nice to have the keys handed over and drive it down the ramp inside the building and out to the parking garage to complete the tour of the BMW Welt and have breakfast. 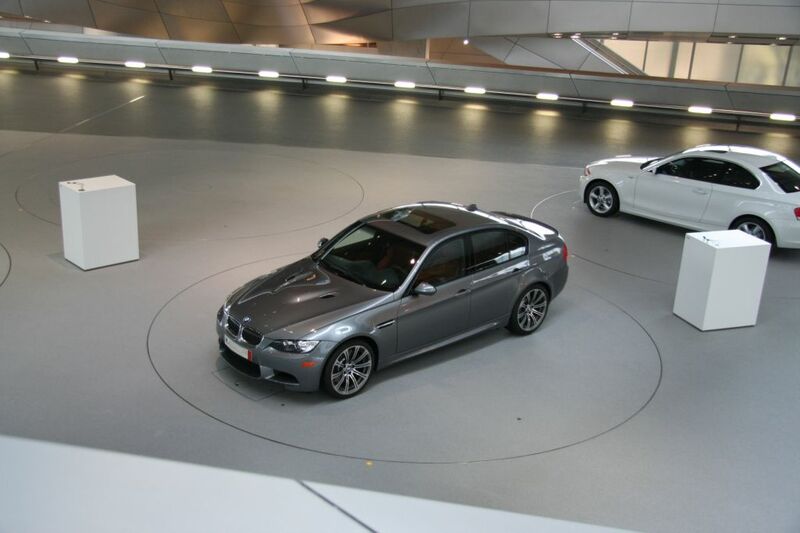 BMW even has the garage parking planned out—they give you an exit card to replace the one you punch in on. On the other hand, several things about the delivery process—this was through the diplomatic-military sales program—were not up to snuff. First, and I suppose as a cost-saving measure, they only fill the tank to a quarter. Now, in the M3, a quarter tank is about where the “bingo fuel” light goes off; so literally the first thing you do after getting the car on the road is to pull over to pump in a full tank. Memo to BMW—increase the price of the car by the $100 fill up and make your customers fill less cheapened out. The other thing that also struck me was that BMW has now cut some other nonsensical corners on the car—for example, the toolkit has no sunroof crank anymore, even though a) its says you should have it in the owner’s manual and b) theoretically, you could get stuck with an open, inoperable sunroof somewhere you don’t want to be (will BMW replace a sodden, wet interior under warranty?). They’ve also removed the neat iPod storage in the armrest that was in the 2008 models so it was stored out of the way. But, you only notice those things later, not when you are first driving down the road. 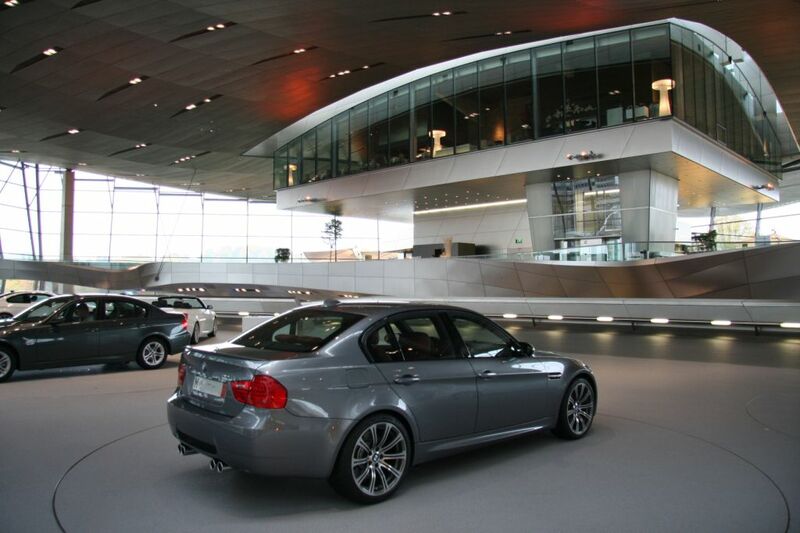 At any rate, after driving out of BMW Welt, I headed toward Paris, our new home, using at first mostly the B roads (secondary roads) from Munich to south of Stuttgart and then on to Karlsruhe/Ramstein. This was a couple of hundred miles done gently, with varying RPMS and gears changes, and off the autobahn. From Ramstein though I was mainly on the autobahn until crossing into France, to the Autoroutes. Although some of the autobahns may be less speed restricted than the autoroutes in France (which are 130km/h during good weather, observed more in the breach), the road quality in the (albeit expensive) French toll roads is about the best in the world that I have driven and lane discipline is excellent. For about the last two hours of the trip I was accompanied to two new 911 Turbos with Luxembourg plates, who, had they been more willing to brave the occasional photo-radar, would doubtlessly have flown away from my self-restrained break-in speed limit, but they seemed very taken with the M3 as were many of the French and Germans at the frequent fuel stops along the way. While I have seen a couple of M3 coupes so far in Europe, as well as M5s, I have seen no M3 sedans as yet, and apparently neither have most car fans in France. Impressions of the car now being able to drive it in Europe (versus my test drives in the U.S. before ordering): an ideal long-range cruiser for the European roads. The wheelbase is great for the roads here, and the visibility out of the sedan is very good (I’m coming from an E46 M3, which did not have as good outward visibility). I’d read a lot of comments about torque deficiency, but it seems (more than) fine to me. The car is relatively quiet at lower revs, but even keeping below the 5500rpm limit, you can still hear the V8 sounding off early. The adaptive lights work well, but the real kudos go to the xenon high beams. 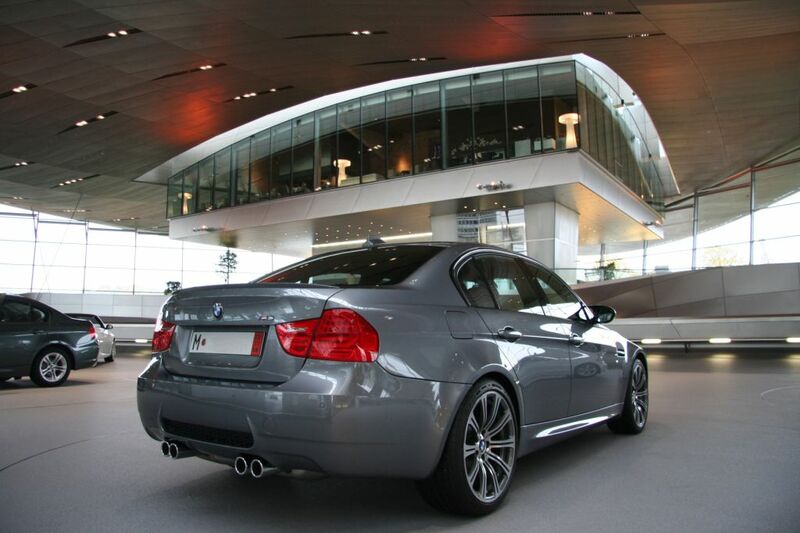 And once I got into Paris, the M3 was fantastic in the dogfight traffic of the peripherique (the beltway that runs around Paris and is anarchy in perpetual motion). Again compared to the E46, I really like the new outside and inside mirrors, which are much larger and give much better peripheral vision (great here with the motorscooter kamikaze squads). Our car has the DCT and its really quite impressive (esp compared to the SMG); the EDC was a nice option as well with the “comfort” setting for the cobblestones in Paris. The wipers work very well at high speeds (a pet peeve of mine with our previous E46 M3). And having the four-door is a boon with our son and the child seat. The front seats are really fantastic, and the only thing I would improve is to add memory to the lumbar and the side bolsters. The new iDrive is very good (my first experience with iDrive), and the Navigation displays are excellent, if not better. The 3D perspective display option is superb for driving in the city. The multiple destination feature in the Nav is great as well, and there is apparently a way to be able to import trips (with up to 50 destinations) from a USB drive, which suggests you can plan these off-line (maybe in googlemaps?) and import them into the car. Still trying to figure that one out. The CD/DVD player will play DVDs coded for region 1 (or region free), as long as the parking brake is on. Together with the “rest heat” function, it’s a nice option for waiting outside the store or if the “stau” is really, really bad. Two things we have discovered after the fact, however, bear mention: first the BMW Assist/Telematics is completely inoperable here. This is ludicrous and something that BMW needs to address, especially for those who take European Delivery or like us, will be in Europe for several years. It used to be when you took ED, you would get a European radio, and when the car was shipped back, a US unit would replace it. BMW needs to do the same for the telematics unit; after all this is a huge PR push by BMW to sell these services for safety (accident notification) and for vehicle theft (in fact, they probably just need to have the unit codeable for all markets). The other issue we discovered is that the Real Time Traffic Info (RTTI) for our U.S.-spec system does not work here. 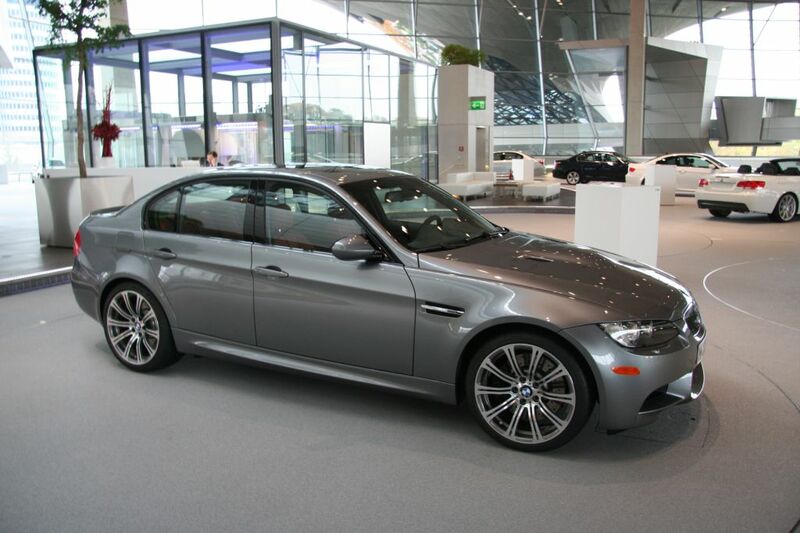 Apparently, for the 2009, and maybe 2008 M3s, BMW changed something in the system and its offline. Someone I know with a 2008 335i has it working, so go figure. But it’s a serious drawback because being able to reroute around traffic jams is a big attraction of the factory system and here in Europe, the roads are all seeded with sensors, so the coverage is excellent. 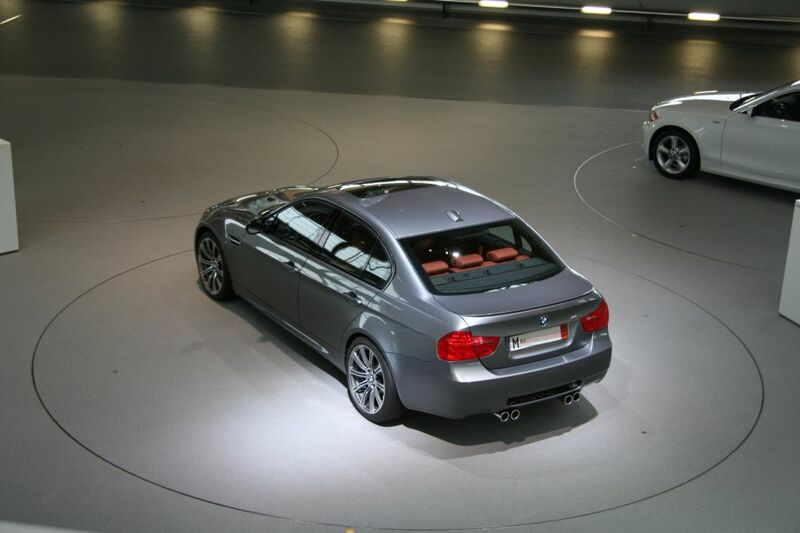 What is really annoying is that we had no indication from BMW when we placed the order that there was any issue with these gizmos working in Europe (where, by the way, they build the car…). An appeal has been lodged. Other than the telematics and RTTI, most of the other gadgets (Bluetooth, PDC) worked well. I did find that if we switch drivers in the middle of a trip, and we tried to continue the same route, it would sometime reset the preferences for avoiding highways, and then would try to send us through some other strange route, that only made sense because the “avoid highway” setting had turned itself on. If we put in the final destination anew, it was fine then. Odd. Another nit: the display brightness control is not very good; it doesn’t seem to vary the brightness as well as the ones in the E46 dash. Some other things that I noticed: there is an option for a night display in the navigation, but at first it did not seem to modify the display at all. Another M3 owner on M3Post helpfully pointed out that you have to disable the traffic map display (which in any case doesn’t work for us here, did I mention that? ), to be able to switch on the night display. Once I got that one to work, its very good for dark roads. One tip: since reaching the night display option is several steps thru iDrive, I programmed the on/off function into one of the memory buttons to be able to access it easily (suggestion for BMW—find out from Garmin how they regulate the night display option automatically). Between the trip back from Munich and a trip to Belgium and to Chartres, we’ve logged close to 1600km already so, with a couple of more short trips we have planned we’ll soon soak up the remaining km to the break-in service. For the time being the only work planned on the car is installation of the alarm, wheels locks, and when December rolls around, mounting the Sport Edition winter tires with Dunlop M3s that we shipped from the US (TireRack) for ski trips. I’m curious to see how the Dunlops perform; I opted for the factory recommended sizes (235/40-18 all around); since we’ll be going skiing, but in the Z-rated version (maybe the only Z-rated winter tires out there? ).